More and more people are using video as part of their online communication and, more and more people are consuming video content. Most new mobile phones have video functionality and, as the use Apple’s iPad and other tablet type devices becomes more popular, the consumption of video content is predicted to keep on growing. 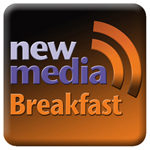 The New Media Breakfast will look at the different types of video content and look at some of the successful videos used in current marketing. We will also look at different options for producing video content and the type of equipment for video capture. Capturing the content is only part of the process, we will take a look at video syndication and how you promote your content and encourage people to watch it and share it.